When The Black Serpent was first announced, it was teased that the pack would contain a brand new Spirit Rohan hero. 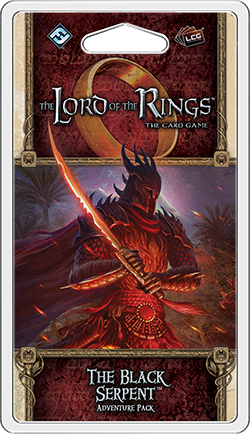 This of course prompted a great deal of speculation within the community as to who this hero would be, with guesses ranging from Eometh (one of the FFG-created heroes from Middle-earth Quest) to a reskin of one of the Rohan heroes we already have. Ultimately, the new Rohan hero ended up being Fastred, a character that I did not see mentioned at all during the period of speculation. With good reason, as he is not one of the major characters in the text. However, this game has always thrived off of putting the spotlight on people and things in Middle-earth that were barely mentioned in The Lord of the Rings itself. Is that the case with this new Fastred hero? Or will he ultimately be a disappointment? Read on to find out! A den of spiders lurking in the darkness beneath a desert sounds like pure nightmare fuel. But thankfully last time out in our hero review of the Beneath the Sands Adventure Pack, Hirgon was exciting enough to distract me from thoughts of eight-legged freaks. Will the rest of the player cards be diverting enough to stave off my arachnophobia? Read on to find out! Today, I’d like to announce a new video series of solo play sessions that I’ll be starting this week! This new series, entitled Teatime Tales, will take place on Twitch every Friday during lunchtime. That’s 12 p.m. Pacific time for those of you keeping track at home. I’ll sit down, pull out a deck I’ve been experimenting with recently and take it through its paces against a quest or two, time permitting. 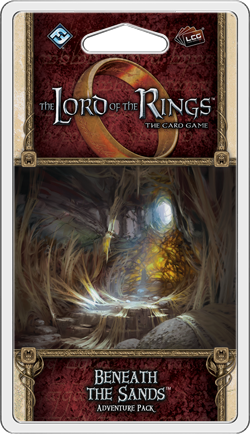 If you are interested in catching these streams live, please head to https://go.twitch.tv/talesftcards and follow the channel. If you’re not able to watch live, then the videos will be uploaded to the Tales youtube channel (follow the link to subscribe) shortly thereafter. Are you scared of the dark? What about a darkness filled with gargantuan spiders eager to devour your party of human smoothies? Well, you’re in luck, because the Beneath the Sands adventure pack is a chance to come face-to-face with these fears. Of course, a new breed of challenges requires the arrival of a new hero, and this pack contains a real doozy. While Hirgon might not be the first name that jumps into your mind when remembering The Lord of the Rings, he might be one of the first that you remember when looking back at this cycle. Why is this new hero so memorable? Read on to find out! Greetings, faithful readers! I did not in fact get lost in the deserts of Harad, no matter what lies those evil minions of Mordor might be spreading. Instead, the less fanciful realities of the world have kept me far too busy of late. 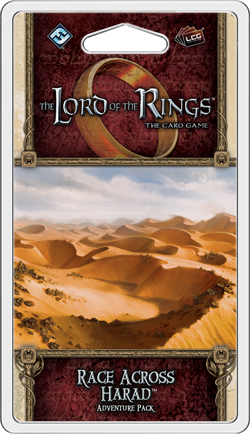 Still, I return triumphantly from the desert to finish the player cards review of Race Across Harad. Last time around, we took a look at Thurindir, a hero that’s all about side quests and enabling decks focused around this card type. However, the rest of the player cards provide support for a mix of different archetypes, but how many of them pass muster, and how many should be left in the desert without water or recourse? Read on to find out!